Finally, the playtesting phase for the upcoming demo started. There were several playtest sessions, some of them in person, with good old friends, some of them remote. These sessions were really useful to detect some level design issues, along with some serious balance problems with the miniboss of Area 3. There will be more sessions later on, but for now I've been fixing most of the recently found issues. There were a couple dozen bugs that appeared because of the new control options, too. Even if they're pretty solid there were a couple of minor bugs here and there that went by undetected until now. I also spent plenty of time on sound design of existing objects. There are new ambient noises in certain rooms, along with dedicated impact and death sounds for robotic enemies. This was a lengthy process, but right now the priority is to have, on release day, a very solid and polished game. As there's more content on each demo, the production and polishing process takes longer each time. Scripting wise, this new area was the most complex so far. Hopefully the rest of the areas will be relatively simple to finish and test, compared to this one. If everything goes well the new demo should be out in 3 or 4 weeks. 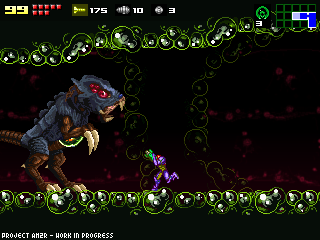 Until then, I recommend that you play the original Metroid 2, and get a feel of the third area. 3-4 weeks puts us at the end of March-beginning of April. This would be the best birthday present EVER. I am super psyched, I need to get into practice again so I don't screw up too badly in area 3. Absolutely can't wait! You're the man, I've been following this religiously!! You're amazing, Doc! This looks FANTASTIC! Take all the time you need or want. Doc I love the additions you've made to the game but can you also make it so you don't go as slow as a sloth when your moving in water? Also when I play the game normally I don't lag but when i try to use my xbox 360 controller with it(I'm using the wireless connector with my xbox's controller) the game starts to lag like hell, could you please fix this? The recommendation of playing the third area on Metroid 2 sounded like a threat...I have a bad feeling of what's to come in AM2R Project, bad as in difficult, which means I REALLY have o play Metroid 2...but i'm really looking forward to this demo in 3-4 weeks...so keep up the great work!!! You "alone" have outdone the work of "the many"
Sweet! I can't wait to play the hell out of this demo when it arrives :D. Keep up the good work doc. Great, I can't wait to test it. Take your time thought, I think we all understand how difficult it must be to make such a game. One month until the demo. It is truly the best demo release date ever! Hmm... ideas are also welcome? Well I am not too sure but might you by chance have a talented concept artist that has already done newly designed enemies/bosses? For me I love to sketch out original and interesting monsters with their own patterns, I can even do redesigns as well! And also if you were wondering what kind of new boss idea(s) I have in mind.. An insect-crustacean for example that walks on water surfaces which has the ability to generate electrical waves down through the body of water, Samus Aran must be cautious and agile to fight the hostile creature within a dark/damp narrow chamber. Either way I am highly interested to see what you and your crew have planned out with the bestiary listed in the game project, continue forward with determination! There will be more enemys that can get down samus to the floor and she need to stand up? Awesome! I cannot wait for this! You are doing the whole community a large favor, you know that? And I don't know how we would repay you. If it was up to me, I would buy it, definitely. Like a bunch of us, we are very looking forward to this new demo! Since I haven't played the original enough to truly compare the two but I have had so much fun with your demo that I can't wait to see your next addiction to your epic creation! I'm very glad to see that this exists, as Metroid 2 is the only one in the series that I'd never played. Until recently I found it available on the 3DS Virtual Console, at least. As much as I'd love you to get it done today, I'd love much more for you to get it done right, and if it takes until a month after Metroid 6 comes out for the Holodeck, so be it. Take your time and don't compromise the GREAT quality you've established so far. Doc, did you compose the music for AM2R? Because it's brilliant, far better than the original. Dark, mysterious...Nintendo worthy in my opinion. But what do you mean about Area 3? Will the Demo go from the beginning to there?? Will the entire game be released like this? One or two more areas with every demo until the end? Like those episodic BttF and Jurassic Park adventure games?? I'd personally prefer the whole game all at once, but I really don't care as long as you deliver. I know it'll be amazing however you put it out. I wonder if this new demo will be playable.? And it will be available the link to download this new demo.? Thank You is all I can & needs to be said!!! I don't have much to say because I don't follow too much your work "No time". But the demo I played was good, so, good luck! Great Work. I'm not too worried. In all honesty, in the original game Areas 2 and 3 were like 60 to 70% of the game. Even if he's decided to enhance the later areas and make them less teensy, he DID say a long while ago that all of the areas were about 90% or more complete. I think we'll see this one get the awesome completion that it deserves. The Doc is back and with some great new looking forward to play the 3rd area keep going its looking good. The only thought I've had, and I don't know if it is feasible, is I'm assuming like in the original game, there will be some standard Metroid larvae right before the queen but what if, should the Metroids be successful in stealing say 100 units of Samus's energy, that they immediately moult into an Alpha? Su trabajo es increíble. Comprendimos que usted es solo uno y no tiene tanto tiempo, por eso nos quedamos a esperarlo. Ya hiciste más que necesitaba, pero sigues haciendo más. Gracias, estoy cierto que el juego será perfecto. Ya sé que Nintendo ha contactado usted. Dijeron que te hán contratado. Creo que sea verdad, por cierto tu lo mereces. Sigue así. Grán juegos tendrán tu nombre en sus créditos. Hey man! I would love to play this game but after the first room the game uses all of my CPU power. Now I have no gaming rig but I can play 2D game just fine, accept this one. My CPU is clocked at 1.5 GHz and I have 4GB of RAM with a 128MB video card. I really want to play the game but its very annoying to play when all my CPU power is being used because the sound and FPS is unstable. I know the game isn't done yet so its not optimized but could you work on optimization a little bit? I can even play KSP and I cant play this, I think thats a sign this game needs some optimization. Anyone else having an extreme(as in harder than any final boss I've ever faced)amount of trouble on the space jump miniboss?